After TEN YEARS of being on Twitter one of my tweets finally went viral! 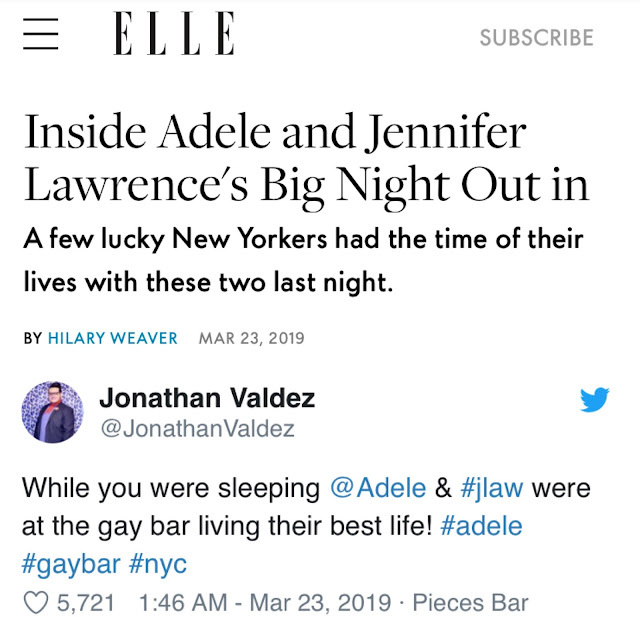 It feels super appropriate that the tweet that went viral and was seen around the world (literally) was of course about two megastar celebrities having a fabulous time at a New York City gay bar. It all happened in the quite wee hours of the early morning (for me at least) of Saturday, March 23rd. Something caught my attention on Twitter which thankful lead me to continue scrolling through the app. 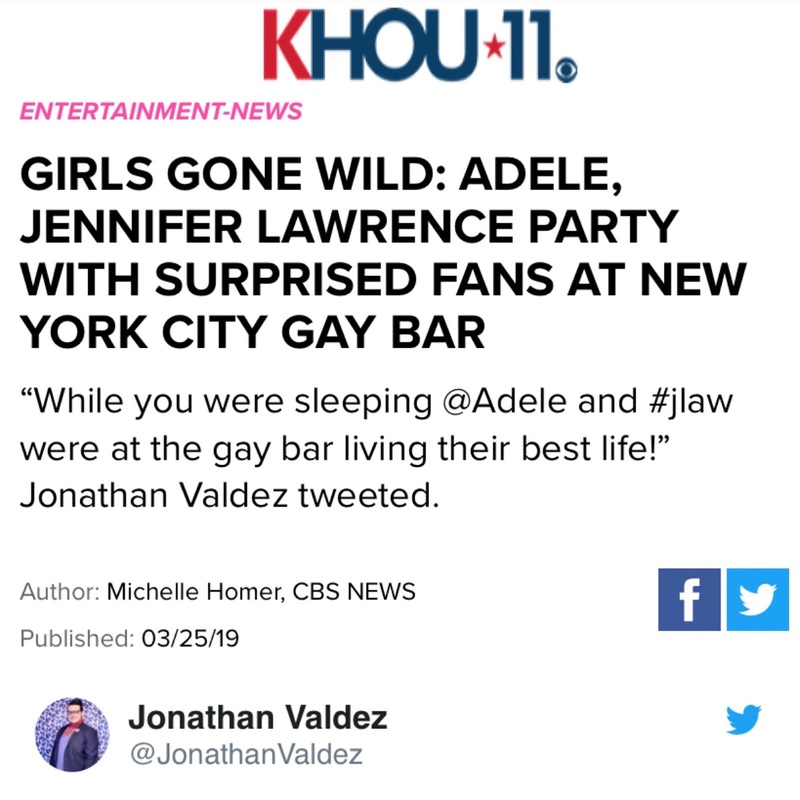 All of a sudden I saw someone tweet that they were at Pieces gay bar in New York City along with none other than Grammy Award winning singer, Adele and Academy Award winning actress, Jennifer Lawrence. I raced to Instagram to find a video and found the perfect one via @hankmarcussen. I shared it on all of my social media and included a cute little caption on the video that read, "OMG!!! @adele just having a kiki with the gays @piecesbar is life! She is living her best life with #jlaw #adele Video: @hankmarcussen." 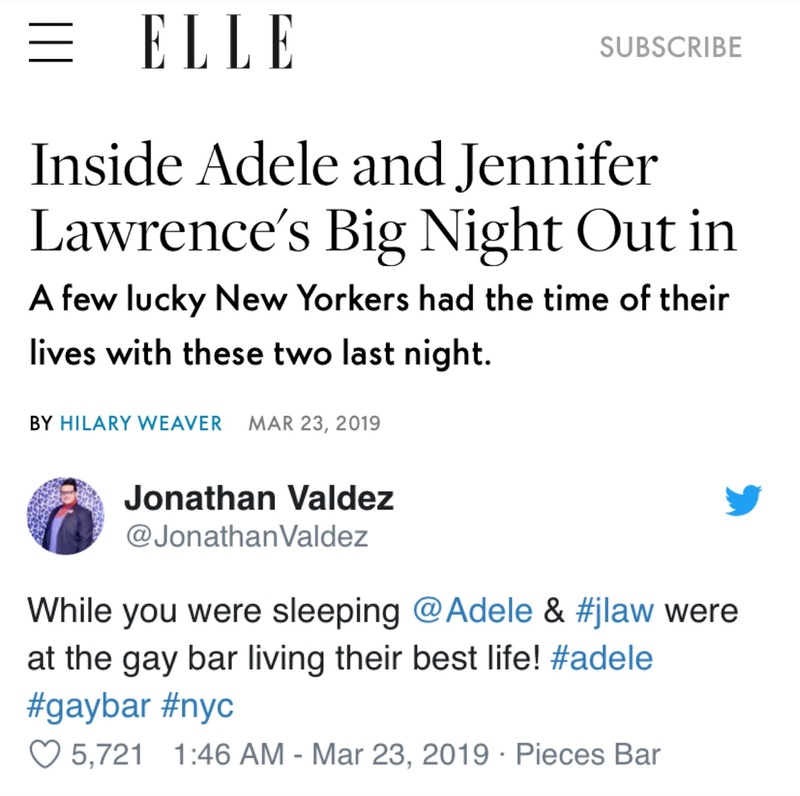 When I shared the video on Twitter and tweeted, "While you were sleeping @adele & #jlaw were at a gay bar living their best life! #adele #gaybar #nyc" I had no idea that the tweet would blow up and go viral! I went about my life but started noticing that the tweet was quickly picking up momentum with likes and retweets. I thought to myself, "OMG, this may go viral!" I went to sleep and woke up and it had reached over 300,000 views and I freaked out! As the day went on a friend sent me a screen shot of the tweet in Out Magazine. I did a google search and was beyond shook to find that my tweet was being featured online via Harper's Bazaar and Elle and to international publications like Vogue Taiwan and Entertainment Tonight Canada. My tweet has been seen 1,130,191 times and the video has been played 580,052 times and growing as of this article being written! Thank you so very much to everyone who liked, viewed and shared the tweet about Adele and JLaw! Celebrity and pop culture news is my passion so this being my first viral tweet means so much to me. 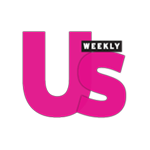 An extra special thank you to all of the magazine and news outlet editors who featured my tweet and me! I was beyond gagged! Check out the press clippings from some of the major outlets that picked up my tweet below! Be sure to follow Jonathan Valdez of Orange Juice and Biscuits of Instagram, Twitter and Facebook!